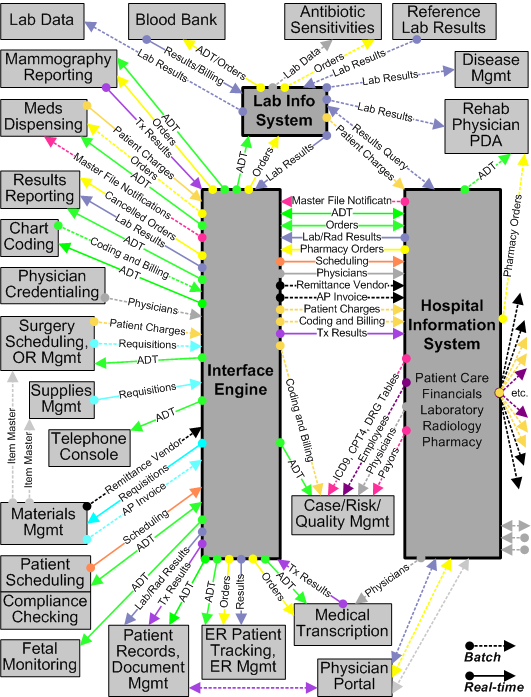 The following diagram shows some of the information technology required to run a typical hospital. The diagram reflects the complex challenges faced by hospital IT staff. In the diagram, the various end-user applications exchange HL7 messages with the lab information system and hospital information system (HIS). An interface engine routes HL7 messages between the systems. Not all hospital applications are shown; the focus is on the HL7 messages that enter and leave the interface engine. This chapter assumes that for each clinical application, you might need to define both inbound and outbound interfaces. The figure illustrates this by providing a circle at the source of each type of message and an arrow at each destination. Various combinations of inbound and outbound interfaces are shown. Within this chapter, an interface is inbound or outbound relative to the clinical application. An inbound interface receives messages from the HIS or lab system via the interface engine. An outbound interface sends messages to the HIS or lab system via the interface engine. Other interfaces within the hospital IT configuration are outside the scope of this chapter, even if they appear in the diagram. In the diagram, solid arrows represent real-time information exchange; dotted arrows represent batch transmissions. Variations in arrow color highlight the different categories of data: green for admitting, yellow for pharmacy, gold for patients, orange for scheduling, pink for master file notifications, purple for transactions, aqua for requisitions, blue for laboratory, gray for physicians, and black for vendors. Use an Ensemble production as a routing engine, as described in previous chapters. Convert each of the existing interfaces to use the Ensemble routing engine instead of the previous interface engine. The conversion approach in this chapter leaves the existing interface engine in place and converts the interfaces one by one to use Ensemble. Unconverted interfaces continue to use the previous engine while you test and confirm that the new interface works properly using Ensemble. As soon as the converted interface works correctly, you begin work on the next unconverted interface. This incremental change policy ensures the best chance of uninterrupted, error-free service during the conversion. You could take an approach that converts groups of related interfaces at the same time. That is, you could decide to convert all of the interfaces that convey messages to and from the Blood Bank application, then move on to Fetal Monitoring. Still, you may find that the work boils down to converting one interface at a time. The procedure in this chapter reverses the order in which you would usually describe an Ensemble production. (An HL7 business service receives an incoming message...) However, experience with interface conversion shows that if you develop the elements top-down, beginning with the business service and working down to the custom schema, you must often backtrack to previous steps to fill in or correct the names of the lower-level items, in the various forms where you have configured higher-level items. The following steps outline a general-purpose backup procedure for Ensemble productions that use HL7. The exact steps will vary depending on your packaging and naming conventions for Ensemble classes, custom classes, routing rules, and custom HL7 category definitions. Start Studio and change to the namespace that you are backing up. Right-click and select Export from the context menu. Select the Export in XML format check box, choose an appropriate file name, and click OK. Select Tools and Export, then click Add. Choose Files of type All Files, enter File name *.cls, then click Open. Select your classes from the list and click Open to add them to the Export list. Export your own business rules (File name *.rul). Export your own Custom Schemas (File name *.hl7). The resulting XML file(s) can be imported into any Ensemble-enabled namespace. For more information about ObjectScript functions like $ORDER and $EXTRACT, see the ObjectScript Functions chapter in the Caché ObjectScript Reference. write !,"Backup to file "_filename_" done.",! The above example expects a parameter pDir to be passed to the method, but pDir can quite easily be set to a specific directory by the backup method. The example uses the ObjectScript functions $TRANSLATE, $EXTRACT, $ZDATE, and $HOROLOG as well as the %File.Exists() and $system.OBJ.Export() methods. Each clinical application in use at the enterprise provides its own HL7 application specification document. The specification document explains which types of HL7 event the application can send (or receive), and which message segments and pieces of each segment the application sends (or expects) for these events. For example, for an MSH segment the HL7 application specification document shows exactly what the segment will look like, what will be hardcoded, what format will be used for strings, etc. The information is extremely detailed. The administrator of each clinical application can show you this document for his or her application. The source and target applications each have an HL7 application specification document. However, any single interface between these applications, such as the interface that you are converting, uses a small subset of the possibilities listed in the specification document. Your best source for a description of an interface is actually the interface definition that you are replacing. In preparing a description of an interface that you are converting to Ensemble, it can be helpful to compare terminology between the technology you are replacing and Ensemble. As an example, the following table lists analogies between SeeBeyond and Ensemble terminology. PV1:18 Patient Type = "ER" or "ECM" or "ERQ"
ORC:1 Order Control = "NW" or "CA" or "OC"
PID:5 Last Name not "TEST"
Copy source MSH to target. Set target MSH:11 Processing ID = "P". Copy source MSH:10 Control ID to target MSH:13 Sequence Number. Copy source PID to target. Set target PID:1 Set ID = "1". set its Identifier Type = "PI". Copy source ORC to target. then set target ORC:5 Order Status to "CA". set target ORC:2.2 Placer Application = "ULTRA". Set target ORC:3.2 Filler Application = "ULTRA". Copy source OBR to target. set target OBR:2.2 Placer Application = "ULTRA". Set target OBR:3.2 Filler Application = "ULTRA". Set target OBR:4.3 Coding Scheme (SIM Department) = "LAB". In this step, you must determine which HL7 schema will be used for the inbound and outbound sides of the interface. This begins with an approximate choice, which you refine by testing messages against that schema in the Management Portal. Each clinical application has an HL7 application specification document that identifies the HL7 schema version that it uses when sending messages, and that it expects when receiving messages. You can confirm this version against the message data sent by the application. Its outgoing message MSH segment states an HL7 version number that (in theory) announces what HL7 version the application is using. You may discover that neither source of information is strictly accurate. Clinical applications can update their HL7 versions at different times so that one application uses a new HL7 version and another does not. Applications can upgrade HL7 versions or add or change Z segments or without changing the contents of the MSH segment or documenting the change. Capture some sample messages from the source application in text files. You can use archived file copies of these messages, if you have them. In the Management Portal, use the HL7 Schema Structures page to find an HL7 standard schema that seems to match the structure of the message segments you are interested in. Use the Message Viewer page to test your text file messages against your chosen schema. Try different choices of schema until you find the standard schema that most closely matches your message structure. Do not be concerned with the specific HL7 separator characters expected on each side of the interface. The HL7 business operation handles these appropriately. If the message contains extra Z segments, and the schema defines those Z segments, the message is okay. If the message contains extra Z segments, but the schema does not define any Z segments, the message is okay. If the message contains extra Z segments, and the schema defines Z segments, but the Z segments found in the message do not match the Z segments in the schema, it is a bad message. If the message contains extra non-Z segments, then regardless of Z segments, it is a bad message. For background, see Controlling Message Validation in Ensemble Virtual Documents. For HL7 details, see the reference for the Validation setting in the Ensemble HL7 Version 2 Development Guide. If the messages trigger one of the bad message error conditions, try choosing a different standard schema. If that does not work, create a custom HL7 category definition to accommodate the nonstandard message structure. See Creating Custom Schema Categories in Ensemble Virtual Documents. Repeat a similar procedure to choose a schema for the outbound interface. Create routing rule sets. For information, see Defining Routing Rule Sets for HL7 in the Ensemble HL7 Version 2 Development Guide. Create DTL data transformations. For information, see Defining DTL Data Transformations for HL7 in the Ensemble HL7 Version 2 Development Guide. The business operation for an HL7 interface controls the outgoing message transmission to the target application. For information on adding HL7 business operations, see Configuring the Production in the Ensemble HL7 Version 2 Development Guide. One is an FTP or TCP business operation that controls the FTP or TCP transmission of HL7 messages across the interface when the production is running normally. The other is a File business operation that sends HL7 messages to a file during testing or troubleshooting of the interface. By Ensemble convention (the items have the same configured name) only one of these configuration items can be enabled at a time. Enable one or the other depending on whether you want a test environment (the File operation) or a live environment (the TCP or FTP operation). Examine the target application to see which separators it expects HL7 messages to contain. Create the live (FTP or TCP) HL7 business operation. Use similar steps to create a test (File) HL7 business operation. For additional details, see Working with Multiple Versions of a Business Host in Configuring Ensemble Productions. You can create a new HL7 routing process. For details, see Configuring the Production in the Ensemble HL7 Version 2 Development Guide. The business service for an HL7 interface receives the incoming messages from the source application. For information on adding HL7 business services, see Configuring the Production in the Ensemble HL7 Version 2 Development Guide. One is an FTP or TCP business service that receives HL7 messages from the source application via FTP or TCP when the production is running normally. The other is a File business service that receives HL7 messages from a file during testing or troubleshooting of the interface. By Ensemble convention (the items have the same configured name) only one of these configuration items can be enabled at a time. Enable one or the other depending on whether you want a test environment (the File service) or a live environment (the TCP or FTP service). Create the live (FTP or TCP) HL7 business service. Use similar steps to create a test (File) HL7 business service. Generally you need to maintain a separate test production that is an exact copy of the production that runs live at your health facility. Develop the new Ensemble interface within the test production. When that is done, you can migrate a copy of the new interface to the live production. Examine the resulting HL7 message data in the output files to see if it meets the requirements for the target application. HL7 business service and business operations have a configuration setting called Alert On Error. When Alert On Error is set to True, as soon as the item encounters any type of error condition it automatically triggers an alert. An alert writes a message to the Ensemble Event Log and can also send notification to a user via email or pager. Setting Alert On Error to False disables the option. This procedure describes how to add interfaces to the live production one by one. Alerts are easy to configure as described in this step, once they have been set up. To set them up for the test or live production, see Pager and Email Alerts in the Ensemble HL7 Version 2 Development Guide. Disable the old interface. For eGate elements, disable the start automatically option.